160 Standalone Hair Colors! 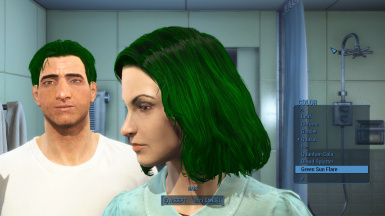 120 Colors added in LMCC Packs! All Hair Colors are Higher Quality Textures put on a Higher Quality Gradient than Fallout 4 Originally Came with providing for New, Unique, and Epic Hair Colors! Two more LMCC Packs Added! Post War Venom If you want her hair color. Venom LastRites Character Preset Pre War Same as the others. Feel free to use this mod as you please as long as it is not for monetary gain! Read the Thank You Section! NOW STANDALONE!! And LooksMenu Customization Compendium Integrated! ****Nuka Wolrd DLC Colors added as Standalone now, meaning you do not need Nuka World DLC to have access to these new colors. Listed as R-EHC Standalone Pack 16 under Downloads! More Colors and LMCC Additions to come in the future! Would you ever believe that the textures from a Mirelurk would make for an awesome hair color? 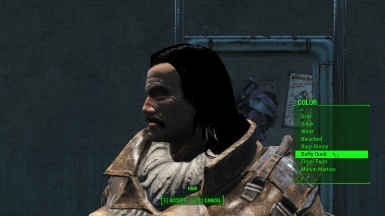 How about a HD Blood Splatter texture from Skyrim? I challenged myself and took textures from games (Fallout 4 and Skyrim), pictures from the internet, and pictures that come default with any new PC and I turned them into some very epic hair colors that I now share with you! 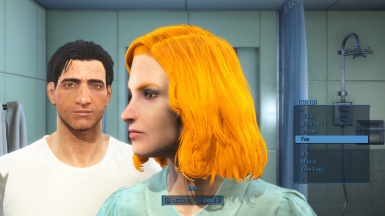 I present to you my 23rd Fallout 4 mod, "Repurposed - Standalone Epic Hair Colors"!! Note: Please ignore the insufferable DBag to the side of the lovely lady modeling the hair. Thanks to Tyrannicon for the Video, this mod is featured at 0:56 into the Video. 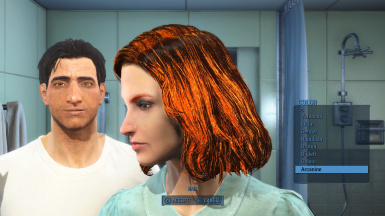 I have increased the quality of the hair color texture file for this mod, thus doubling it's size, and hopefully providing for more elaborate hair color. All 22 hair colors have been changed, I will provide a downloadable pdf file that states the original hair color and what I changed it to. I have created an .esp file that will change the names of the Hair Colors in the game that I will also put for download. *Denotes some of my personal favorite colors (My two favorite are probably Dirty Teddy Bear and Fire). Some of the eyebrows seem like the color is running slightly, different eyebrows styles seem to fix this. Note: This mod will NOT be compatible with any other Hair Color changing mods as they most likely changed the same texture file that I did to make theirs. For the full pallet of Hair Colors please view the pictures I included with this mod, as the example Pictures section is a few examples. The Hair Texture file will go into your Data->Textures->Actor->Character->Hair folder. With the .zip file that I provide just drag and drop it into your Data Folder.If you get the .esp file install that as you would any other mod. Make sure you also get the Hair Textures unless you just want the change the Hair Color names in game but not the actual colors (crazier things have happened, like I have 14 downloads of my text file that is just a horrible Parody that I wrote of Tribute by Tenacious D). ****If you are installing the Compatibility Patch for the LooksMenu Customization Compendium then make sure you drag the Data Folder into Fallout 4's Data Folder, and place the ESP in a LOWER Load Order than LooksMenu Customization Compendium.ESP in order for it to work correctly. *****You also of course need to have downloaded and installed LooksMenu Customization Compendium in order for my Compatibility patch to work. There is a link for it below. 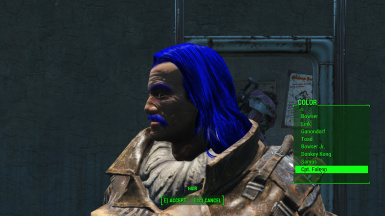 If you choose not to use the .esp file refer to the .pdf file that I provided for guidance as to what is what color. Bethesda for Skyrim and Fallout 4. Google for having a vast assortment of pictures, and the people that post those pictures to the internet. The makers of Fallout 4 Edit. AGodComplexPikachu for allowing me to integrate this with the LooksMenu Customization Compendium. The LooksMenu Customization Compendium can be found at this link: Click Thee Here! This mod was made by myself using Fallout 4 Edit, and Paint.Net (Because Photoshop is too mainstream). 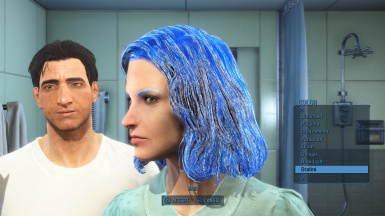 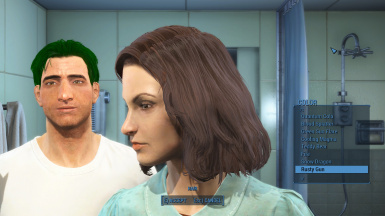 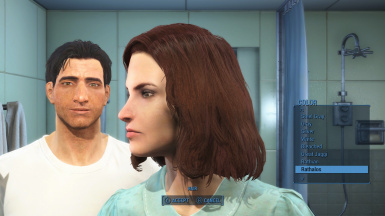 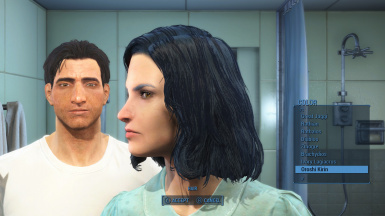 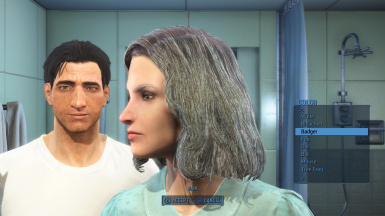 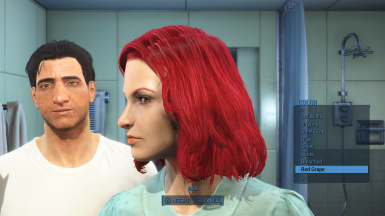 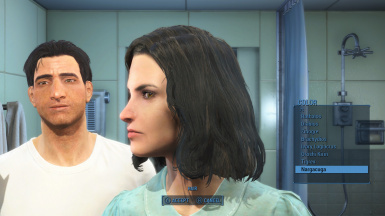 Go give those poor people of the Commonwealth the Hair Colors they deserve, including your poor character of course! I had fun making this, so expect more pallets of hair colors made from textures or images in the future depending on the success of this one.